Is Travel now as good as it gets? 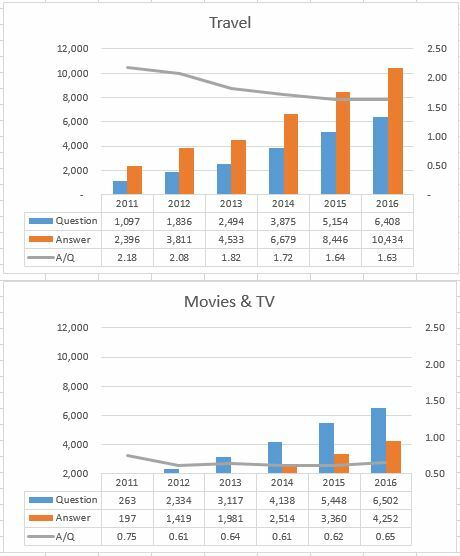 Travel, slightly older, has seen more Questions, sees more each day, has given more Answers, has a higher Answer proportion, and has more users than Movies & TV. 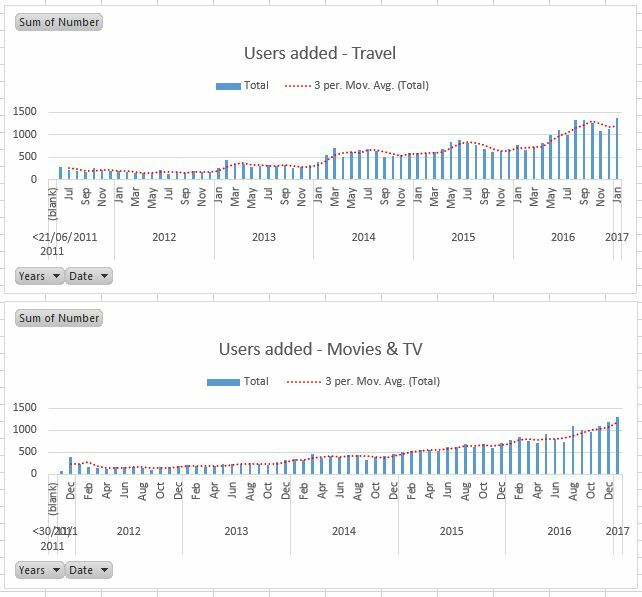 Movies & TV however receives more visits each day. Do the site analytics (only viewable by those with 25k+ rep) give any clues as to why this might be? Or, since not many users may have access to these for both sites, are there any plausible theories why this might be so? Magento I can understand is not really comparable – the number of Questions there somewhat surprises me – and it is must be predominantly "business" rather than "personal". Travel I know is predominantly "personal" and I would expect Movies & TV to be also. There would seem to be a high component of choice in both (unlike say a DIY site) and I would expect language to be more of a barrier for Movies & TV than for Travel. Judging by the quality of English on Travel, I doubt many of our users would greatly enjoy what for them would be foreign language films and quite likely concerning a culture somewhat alien to them. Travel by its nature has a world-wide catchment area. With so many films and TV programmes of note made in English, I would expect the main 'market' for Movies & TV to be English speaking nations. seems to have progressed further and faster than Travel. Perhaps Movies & TV (about which I admit I know nothing) is getting a lot of support precisely because it is related to helping to improve English language skills. On culture though I would hope Travel can compete. The point being whether, if Movies & TV are doing something better than Travel is, what that something might be and whether it might be a lesson for us. People tend to have questions they need answered on travel. Lots. Visas, how to get from A to B, stuff that isn't always that easy to find out. Lots of people google actors, movies, just for information. If you can't find out the age of some former starlet, far fewer people are likely to ask on a website. But if it's been asked, and answered, a lot more people will find it via google and look. That would/could explain a discrepancy, however as others have pointed out, the difference is minor, and the traffic is measured over recent time. We get more traffic in July/August (northern summer holidays), and right now a huge Star Wars movie is out that would attract geeks to the internet and movie sites. 1000 views is literally one popular question difference. 1000 visits a day difference? Pah, that’s almost a rounding error. Don’t read much into that number. On a different note as somebody also coming from Anime.SE (which is even more English-centric than Movies because fans watch Animes as original sound (nobody knows Japanaese though) and with English subtitles) and judging by the quality of the English we sometimes need to cope with over there … no, not being able to express oneself (or not being able to spell correctly) is not a barrier for watching English-language films (or reading English subtitles). Additionally, the movies are basically the same all over the world except for a local-language subtitle added — unless the country is large enough to warrant dubbing (Yes, unfortunately mine is …) in which case you can still talk about the content anyway. One thing I think needs improvement is the Visa topic. It feels like half or more of all questions is about Visa procedures, a very tedious and fickle subject, and always changing. I often thought it should have its own area. But then - what would remain? Would it be enough for a healthy page? A lot of the high-rep users have an account on Stack Overflow. This suggests we're not doing a good job of attracting people from the general public. There are probably more interested people and 'specialists' for movies and TV than for Travel. Looking at the US, a large part of the population has never left the country (some think Belgium is a city in France...); but a much higher percentage is watching TV and movies. Not the answer you're looking for? Browse other questions tagged discussion status-completed statistics . What to do with non-English questions/answers? Can/should we deal with requests for suggestions for presents within TSE but off the main site? Do you have to write your questions/answers on here in English? Is there a better way to handle tag renames and synonyms, without radical change?